life in the lower nine: "i wish i was in new orleans..."
I just wanted to give everyone a quick update on how things stand for our troops on the ground (and, we are indeed scattered all over the ground now). lowernine.org evacuated the bulk of our long-term volunteers as of Saturday morning. Christi Lou, Brennan, Gustavo, Eric and Eric fled to the Dallas area, where Christi Lou has family. As of yesterday, all of them except Lou started moving back toward home, and they are now in Shreveport. Ryan and Jonah stayed until Sunday noon, to take care of finishing battening down the hatches on site. They, last call I got, were on their way to Atlanta. Darren, Laura and I left early Sunday morning. We dropped Laura off at the airport on our way out of town, and she flew to Florida (which means she's in the path of Hurricane Hannah now!). Darren and i had planned to go only as far north as we needed to feel safe, so we could get back into the city at the Gulf ahead of the storm, there wasn't a motel room to be had in the state, and believe me, we stopped at dozens and called dozens more. We ended up driving all the way to Tyler, TX before we found a room, and spent last night there. Today we found a room in Monroe, LA, so we're at least back in Louisiana, set to drive south as soon as the weather clears. It appears that there has been no widespread flooding in the city, and none in the Lower Nine. If you've been watching CNN, you've seen the pictures of the Industrial Canal filled to the top of the levee walls, and overtopping the wall on west side (Upper Ninth Ward). The last report we saw, just a few minutes ago, indicated that the water level in the Canal was dropping, so we may have avoided another tragedy. I say "may" because the surge threat is still a worry for another few hours until the storm has passed the area completely. 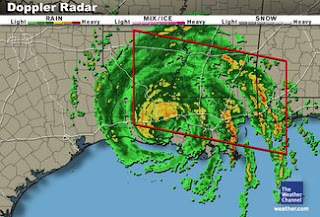 Right now, Baton Rouge is being battered, and we could get over 15 inches of rain even here in northern LA tonight and tomorrow, with winds inthe 40-50 mph range. I want to thank all the lowernine.org volunteers for keeping their wits about them and being willing to secure the property and take themselves to safe locations. We have no idea what sort of damage we'll find when we return, but it's certain that we willhave at least roofs and windows to repair on our residents' homes, and probably our own building as well. At this minute (4:45 pm) reports are coming in that levess in Plaquemines Parish are in danger of breaching, which means that New Orleans is still, as I said, at some risk from storm surge. Thanks for all the calls and emails from those of you who have been trying to get some news about lowernine.org and its people. I've said many times that the unofficial motto of lowernine.org is, "We'll Figure it Out!" I would like to tack an addendum onto that, and that would be, "And We Don't Give Up."